UK: This CD is not available for the UK. 2 Sweet Creature, What's Your Name? Anton Barbeau lives in Sacramento, CA, and has been releasing albums since 1993. King of Missouri is his 7th and possibly the most accurate representation to the mainstream world of how a majorly talented songwriter can create such a fantastic prolific body of work seemingly in an alternate universe where the grand tradition of British pop psychedelia and English eccentricity continue to flourish, channelled through an unassuming American pop accolyte. King of Missouri is like (ok, take your pick) Kevin Ayers, John Cale, Robyn Hitchcock, Julian Cope, or even Andy Partridge fronting the Jeff Beck Yardbirds, or better yet, The Move! The most amazing thing about this album is how the full rock n roll power of The Bevis Frond and the raw lyricism of Nick Saloman's exquisite guitar bristle brilliantly within the constraints of Anton Barbeau's tightly plotted pop structures. It's a fantastic, and actually genius team up. Consider also that bassist Adrian Shaw is an ex-member of Hawkwind and you realize how complete the circle of British progressive rock is within this marvelous cd. This is going to be one of your favourite albums for 2005. Spread the word. Play it loud! "As a prime exponent of melodic power pop, the Sacramento singer-songwriter Anton Barbeau has XTC's Andy Partridge somewhere near the top of his influences list. Now Partridge himself is a fan of Barbeau's eloquently crafted music. 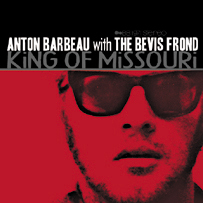 The brilliant title track of his seventh album is just about as good as the genre can get, with a driving riff, 1960s vocal harmonies and appropriately bittersweet lyrics... King of Missouri was recorded in Bromley, of all places, with the help of Walthamstow's veteran psychedelic rockers the Bevis Frond, who embolden Barbeau's singer-songwriter tendencies with a crisp, vibrant backing. On "I Don't Like You" they prove the perfect pairing, sounding like Bob Dylan fronting some great lost British freak-beat band." "Barbeau's cracking (in both senses of the word) voice rasping over Saloman's crystalline guitars like a blessed alliance between The Soft Boys, Cake and XTC, all of whom hold Barbeau in high esteem. Despite the easy tag, Barbeau peddles neither pop nor psychedelia, it's power that's the important word. Though they're completely unrelated references, think of Julian Cope's sprawling Krautrock and Zappa's ironic everything as touchstones for how outsider music can get inside you and change the way you think, feel and hear. Barbeau deserves a place alongside them."